Fruit symbols get the royal treatment in EGT’s casino pokie machine Fruits Kingdom, which sees cherries, oranges and watermelons sharing space on the 5 reels with a King, Queen and crown that doubles any win that it helps to create. Alongside these is a star symbol that triggers a free spins game with multipliers, while the gamble round and Jackpot Cards progressive feature that all EGT pokies feature, are just the cherries on top. This makes it a bit of a mix of traditional fruit machine and modern pokie, that’s been designed to appeal to as many players as possible. There’s just 10 paylines running across the reels, and in normal gameplay, gamblers will want to see matching symbols on adjacent reels on any line from the left side to get a win, with at least 3 of the same type of fruit, or just 2 royals and the crown needed. A simple brown background image sits behind the reels and the symbols are against black reels, which may not be the most sophisticated colour scheme, but it works well and looks pretty good. Above the reels are the 4 levels of the Jackpot Card progressive feature, while below them, we see a series of control buttons used to set wagers from the low limit of 0.10 to the high limit of 200.00 per spin. Before those bets are placed, it could be worth a quick review of the pay table, just to see what the potential returns will be with each symbol and how the bonus features work. The cherries are an exception, as they only need to be on reels 1 and 2 to be worth something, paying out a small prize of 2 coins and going up to 100 coins for a full line of 5 across the reels. There’s 5, 25 or 100 coins for landing 3, 4 or 5 matching peach, plum or lemon symbols, and the orange and banana will each pay 10, 50 or 125. The top fruit symbols are the grapes and watermelon, with these valued at 15, 75 or 250 coins. The King and Queen symbols are a bit of a contrast with the simple graphics of the fruit, as these are drawn in a very realistic style, while the payouts from each can add some very real cash to a players’ bankroll. Just 2 of a kind pays 2 coins, but a payline filled with 5 Kings or Queens will pay out 750 coins. The crown sits on top of the payscale and is worth anything from 2 coins to a massive 10000 when it stops across a payline, but it’s also the Fruits Kingdom video pokie wild, and can act as all except the star to help complete winning combinations. To make this shiny symbol even more rewarding, any time it substitutes for another to create a winline, the value is doubled from whatever it would have been if the line had all been made of a standard symbol type. A bright yellow star is the trigger for a free spins bonus round, but is also worth some of the best payouts when it lands in any 2 or more positions, with up to 5000 coins awarded. At least 3 will be needed to enter the bonus game however, and players are given an initial 15 extra spins, during which any wins will be tripled in value. If 3 more scatters turn up in a free spin, an additional 15 will be added on to the end of the round. If a win was for less than 350 coins, there’s the option to play a double or nothing gamble game, which requires players to guess if a card will be from a red or black suit. A correct pick gives them the further opportunity to double it again and again, but making a wrong choice at any point will lose both the triggering bet and anything gained in the gamble round so far. The 4 jackpots above the reels range from a small Club award, through to Hearts, Diamonds and the top Spade prize. When the random Jackpot Cards game begins, the lucky player is guaranteed to win one of these, and will need to find 3 matching cards from a field of 12 to scoop the related prize. 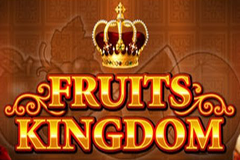 An unusual mixture of fruit and royalty is blended together in the Fruits Kingdom video pokies, and while there may be no obvious connection, few punters are going to be that concerned once the wins start coming in. The multipliers from wild substitutions and in the free games are real highlights, and the only real downside is that it isn’t mobile-optimised.